The Anzac Memorial Service in Beaconsfield was first held 20 years ago and was organised by the late Tony Rushton. By tradition it is always held in the afternoon on the Sunday before Anzac Day. This year the Sunday before Anzac Day falls on Easter Sunday. The service will still be held, and may have a reduced program. 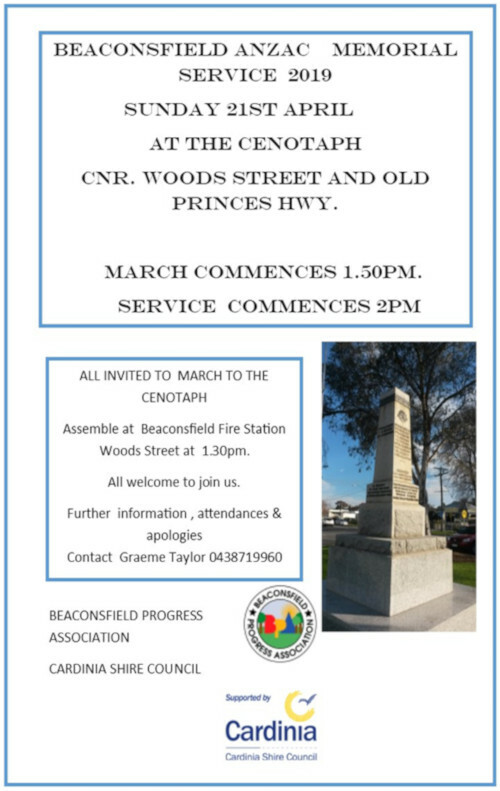 Everyone is welcome to come to the service at 2pm on Sunday 21st April at the Beaconsfield Cenotaph, corner Old Princes Highway and Woods Street.